*yawn* Goooood morning dear readers, if you've been following along on the blog through October you know it was hoppin' around here. You probably noticed me mentioning that offline it's also the busiest month of the year for me. Today I am absolutely wiped out. Exhausted. Mentally and physically tapped. But it was a fun month both online and off so I'm ready to work on closing out the year and starting a new chapter with purpose. November and December always manage to be very busy too in different ways so I thought I'd join the Blog Ahead Challenge as a way to get motivated and inspired to build content for December so that I don't get that end-of-the-year lag going that I often experience. So that maybe the week of Christmas and New Years will find me relaxing with family, reading a lot more than I usually find time for, and with a positive attitude about blogging rolling into the new year. • I chose to focus on ONLY pre-scheduled posts for the month of December because I don't like planning blog posts months before they happen. It's just my style, If I were an author I'd be in the pantser class. • I currently have only 1 Scheduled post and 4 Drafted posts for the month of December. Those drafts are for Weekend Reading posts so I can't count them as part of the additional 30 pre-scheduled. • I will have fewer blog tour related posts in December so I want to mix it up with some fun posts to lighten what is often a very stressful time. I'm planning to do a Movie Monday set of posts and at least 2 gift guides. I'm thinking about doing a mini giveaway once a week too depending on my budget. 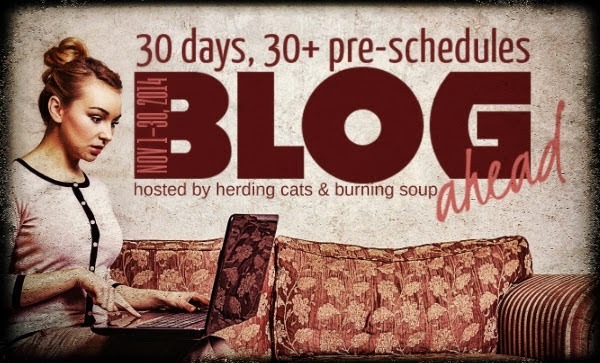 • My overall goal is to have 35 pre-scheduled posts for the month and I want at least 5 of those to be book reviews that I've been keeping on the back burner. Are you a fellow blogger? Are you taking part in the challenge? Please feel free to share a link to your blog in the comments!